For those bold enough to brave the elements, outdoor winter activities can actually be enjoyable. One of the most popular winter pastimes is ice skating. Believe it or not, this can be a dangerous sport, if the proper clothing and equipment are not worn. Before going outside for any activity in the winter, it is important to dress appropriately. The best way to stay warm is to wear layers, with the outer layer being waterproof. When it comes to the layer closest to the body, wear wool and avoid cotton. When cotton gets wet - from water, snow or sweat - it remains wet, cold and clammy and being right against the skin, it is uncomfortable and can lead to a nasty case of the snifflies. Pack an extra pair of gloves into your pockets, as wet gloves are not very comfortable and can cut a day of fun outdoor activity quite short. Don't forget to apply sunscreen to your face, even if it is the middle of January and -15C outside. Snow can reflect up to 85 per cent of the sun's ultraviolet rays. Also, have a snack before going out. The calories will give your body the energy it needs to contend with the cold. The best way to avoid any activity-relate injury is to wear the proper protective equipment. Make sure the ice skates fit properly - they do not allow your foot to move too freely within them, but they do not constrict blood flow either. They must be supportive and do not allow your ankles to roll inwards. Children, specifically, should wear a helmet when ice skating. 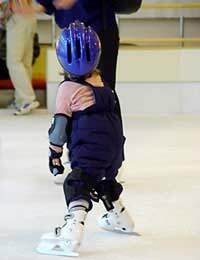 "Head injuries occurred more frequently when ice skating than other types of injuries," according to Jennifer McGeehan, MPH at the Center for Injury Research and Policy at the Columbus Children's Research Institute. "Though helmet use is most often recommended - and sometimes even required for some skating activities - a majority of the children in the study were not wearing protective equipment [helmet, elbow or knee pads] at the time of the injury." Skating on an indoor rink is the best place for the activity. But when only a frozen pond, river or lake is available, ice skating can occur on it, if the proper precautions are taken. If possible, chose a frozen-over shallow body of water. If you do happen to fall in, the depth will be low enough for you to safely walk out. The strength of the ice cannot be determined just by looking at it. Its strength is determined by many factors, which include: water chemistry - is it salt or fresh water; the daily climate - wind, snow, rain and temperature fluctuations; presence of water currents at stream inflows and outflows; the size and depth of the open water; distribution of weight on the ice; and signs of expansion cracks on the surface. Ice is generally considered safe for activities, such as skating, when it is at least 5" thick. However, the thicker the ice, the better. To determine ice thickness, chip or drill a hole through the ice and measure. Keep in mind, that one area of the lake, pond or river may be thicker than another. Therefore, depending on the area you want to use, you may need to check the ice depth in more than one location. If the ice surface is covered with snow, the ice underneath all that light, fluffy whiteness has actually weakened, despite the freezing temperatures as snow acts as an insulator. The best way to avoid falling through the ice is to do a thorough check of its strength but also, when possible, skate on designated areas. However, nature is not perfect and despite your best efforts to avoid weak spots, you still may happen upon them, causing you to fall into the frigid water. Whenever planning an activity, like skating, on a body of frozen water, bring along rope or a pole to assist in the rescue. As well, never go out onto frozen open water alone or at night. If you do happen to fall through the ice, try not to panic, especially since help from your companions will be limited. First, turn toward the direction you came from on shore and lean against the ice. Second, extend your hands and arms onto the unbroken surface and start kicking - this will help propel you forward. Third, as you come out of the water, do not stand up - lie on the ice and roll away from the hole, according to the Ohio Department of Natural Resources. For those who have not fallen through, do not go after him/her or onto the area the person fell through - it did not hold them, so it will not support you. Provide the victim with something to hold onto such as a large emptied plastic drinks bottle to keep them afloat. Once safely afloat, toss the person rope or a branch - something strong enough for him/her to grab onto, but also long and sturdy enough for the others to pull the victim towards you.